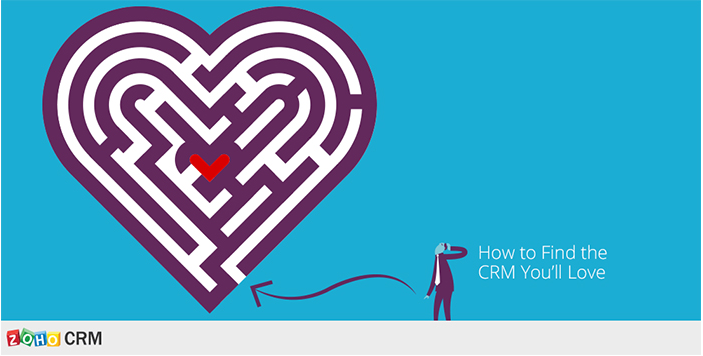 How best to develop the love affair with your CRM software? CRM software has come a very long way since its inception and are now complex pieces of software that are highly adaptable to pretty much all business types and scenarios. Businesses need to be sure they find the right CRM software for they specific needs. Needs of some orgsnisations are different from others. For example, one may be more interested in contact management rather than sales tracking, or in clearly defined quotation-order-invoice tracking as opposed to marketing campaign management. Some may focus on mobile sales, others on call logging. Different CRMs do different things, some are better fat performing some functions than others. For example Sage CRM has a strong quotation to order to invoice process, whereas Zoho CRM has strong integration to other Zoho apps that cater for bookkeeping, recruitment, project management or customer support. Salesforce.com is a fantastic all round CRM solution but its price tag may not be within reach of most SMBs. If you are responsible for the management of a CRM project, you should ask yourself and your potential users: what do they need and who will be using this software in 5 years time? This is also often where many businesses come unstuck on CRM projects: pushing the project CRM project management to an IT team or IT personnel. No disrespect to IT personnel, we love you really, but IT guys are not the best people to manage a CRM project. By the very nature of "CRM", focus must be on the customer, and who deals with customers? It is important to think of the big picture too, and to understand that what you want now may change in the future. This is not easy of course. But it is no good for example satisfying one team only now, to find out later on that email integration required by another team is not included in the feature set. A good example of this is if you were to focus on CRM implementation from a purely domestic perspective - your domestic sales team may focus on communicating with prospects and customers via phone calls and face to face meetings. Whereas an international sales team would likely need more in the way of email communication functions and integration with Outlook. It is a costly experience to stay focussed in one area and not accept that as your business grows more and more people or teams will likely want to use it. Is or will mobile CRM be important? Does your sales team create quotes and invoices? Is or will payment tracking required? Do you need or will you need to do email marketing? When selecting your CRM we would recommend listing your key requirements and using these as a function checklist down on side with the CRM software being evaluated across the top, to make comparisons between various CRM software. No relationship is perfect all of the time and a business relationship with a CRM is no exception! You will no doubt find times when you need to change things in your CRM or when you hit a brick wall on what it can and cannot do. This is when you should really work with a partner of the software provider who can advise you on best practices and on how to devise workaround solutions as they will have an in depth knowledge of the software. They will also be able to provide ongoing training for various user types and levels. Use as many resource channels as you can and get all of your team involved. It may be that you have a user in your midst who has an undiscovered talent for CRM software who can assist others. Cloud based CRM software providers and/or their partners should provide online helpdesks for you, included in your license subscriptions, that can be used to access loads of information and training materials. At this stage it is important that you 'hang in there' and resist the temptation to start looking at other solutions. As with any relationship you get out what you put in, so stick at it, exlore all options and try to think 'out of the box' if the solution is not immediately visible. It may be that you are implementing a CRM because the manual system in place or even a previous CRM that was implemented are not working. A CRM 'project' is often one that lasts several years. It will take work and commitment to make it work. Work at it, remain focussed, review regularly and take metrics to measure success and improvements along the way. Contact Mangoho for a free consultation on best practices for CRM implementation in your business.